Bark’s & Booze may be coming to an establishment near YOU!! In addition to pints, wine glasses and growlers, Virginia booze makers soon may have to set out dog dishes. A bill to allow dogs inside breweries, wineries and distilleries in Virginia has passed through the General Assembly and now awaits the governor’s signature. Bell said he was contacted by Barrel Oak Winery in Delaplane, saying they had customers asking about it. Bell said there’s no health risk in allowing dogs into taprooms and tasting rooms, as long as manufacturing areas are in a distinctly separate part of the building. “It’s a practice we’d like to allow, it helps businesses,” he said. The state has over 180 breweries, 280 wineries and 45 distilleries, according to the Virginia Tourism Corp. The Richmond region is home to about 30 breweries and a handful of distilleries and wineries. Ryan Mitchell, co-owner of Garden Grove Brewing and Urban Winery in Carytown, said he supports the legislation. 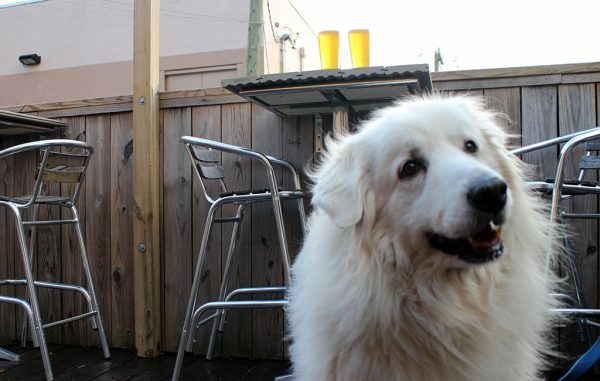 “Richmond is very community-focused and within our community are pets; they should absolutely be welcome in brewing-, distilling- or winery-focused industries,” Mitchell said. Joe Dombroski, who owns of New Kent Winery and serves of the Virginia Wine Association’s legislative committee, said the bill was supported by a newly formed wine caucus in the General Assembly. Dombroski said while breweries and distilleries have done a great job lobbying for regulations in their respective product types, it made sense for all three industries to work together on this bill. Delegates Lee Carter (D-Manassas), Karrie Delaney (D-Centreville), Wendy Gooditis (D-Clarke), Mark Keam (D-Vienna), Kathleen Murphy (D-McLean) and Michael Webert (R-Marshall) were co-patrons of the bill. Bell said the bill went unopposed through the General Assembly in January and February. The Virginia Wine Council lobbied for the bill. It is now en route to Gov. Ralph Northam’s office where he will either sign it into law or veto it. Bell said he believes Northam will sign the bill into law. If passed it would still be up to the discretion of individual establishments to allow dogs inside. Dombroski , for example, said the new bill won’t have too much of an effect on his winery since they’ve always been dog-friendly. “We do an event in August called the Dog Days of Summer. We had over 300 dogs here last summer,” he said. Another local delegate would be particularly affected by the bill. Del. Chris Peace, a Republican who represents New Kent and parts of Hanover and King William counties, owns White Plains Farm & Vineyard, a small winery in Hanover that opened last year. Peace voted in favor of the bill, according to state records.